A bottle shop used to be a quick booze-hoarding stop before heading somewhere more important. 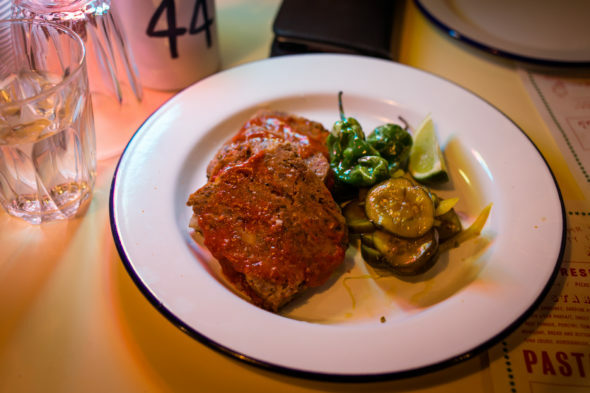 Mr Liquor’s Dirty Italian Disco proves why it should be the main destination. 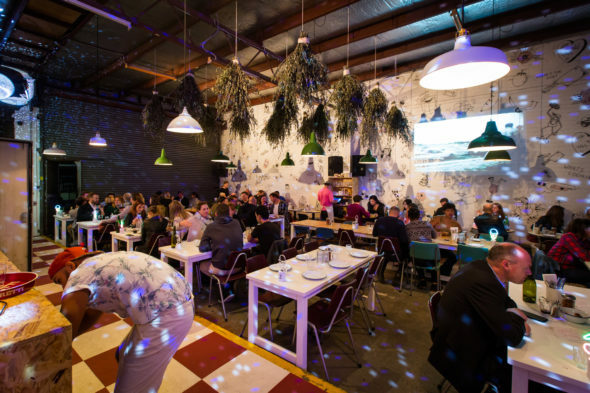 See, when Merivale took over The Tennyson Hotel in Mascot, they wisely handed the keys for the drive-thru bottle shop to the Pinbone crew and Mr Liquor’s Dirty Italian Disco is the (literally) dazzling result. 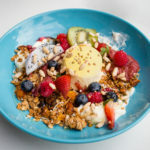 Head chefs Mike Eggert and Jemma Whiteman, plus their front-of-house ace Berri Eggert, are back in the spotlight again – this time, though, that brightness is powered by glitzy mirror balls. 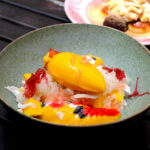 And their talents are undimmed from the break undertaken since their last pop-up, Good Luck Pinbone in Kensington. 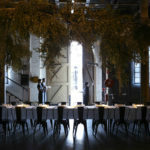 As Will and I chartered our way through the menu – from the home-style comfort of the Meatloaf with Bread and Butter Pickles ($16) to the spring-declaring Pappardelle with Green Vegetable Ragu ($23) and the hazelnut remix of Tiramisu ($11) – we were yet to discover any weak links. It was like a playlist of hits, all A-sides (even the under-the-radar actual sides). I guess as someone with a long-standing membership in the Pinbone fan club, I was always gonna be excited to see what they did next. Their collaboration with the well-resourced Merivale has meant they haven’t had to undergo 18-hour building/varnishing days or subsist on a 12-day Bunnings sausage diet in order to get the site up and running (as they did with their indie pop-up Good Luck Pinbone, where they miraculously managed to knock out some of my favourite dishes of the last year – like the Brussels Sprouts with Tofu Cream and Burnt Onion and the Hand-pulled Noodles with Black Garlic, Cauliflower and Shiitake – on a scrappy combo of two woks, a steamer and grill). 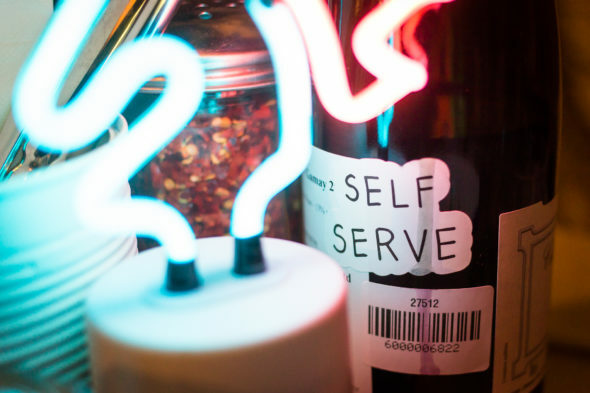 That doesn’t mean that Mr Liquor’s Dirty Italian Disco is free of lo-fi character, though – as Mike told Scott Bolles in Good Food, the bottle shop driveway still features ancient oil stains and chewing gum remnants. “It’s only a dead kangaroo away from being an authentic bit of Australian road,” he said. 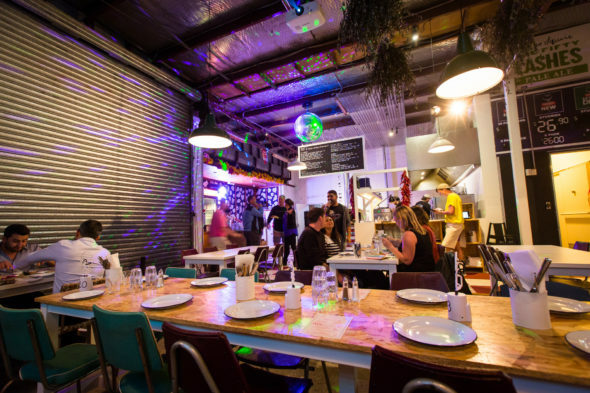 In the open-kitchen area, Mike and Jemma might be sending carrots, lemon or bread into the wood-fired oven – its flames name-checked by the oven’s LOL name, Disco Inferno. The laidback tone is matched by the cafeteria set-up – it’s counter service and you can even channel the bottle shop’s past life by picking a Franck Moreau-approved red straight off the shelf or step into the cool room and get a chilled white or six-pack of beer. And if you’re dressed way too lightly for its icebox temperatures, the venue even has puffy jackets for you to borrow. Don’t worry if you can’t smash an entire bottle yourself, there’s a line of by-the-glass options by the counter, too, from Bondar fiano to Chateau Pierre-Bise gamay. Understandably, Mike is pretty buzzed about what people can drink here, from Selosse (“it’s the best champagne and you can’t really ever get it in Oz”) and natural wines from his friends (Joel Amos’ Bird and the Fox and Brendan Hilferty’s Sparrow & Vine) Plus, as Levins has said, it’s cool to see cheap pet-nats on offer here, too. The food here is a headlining feature as well. 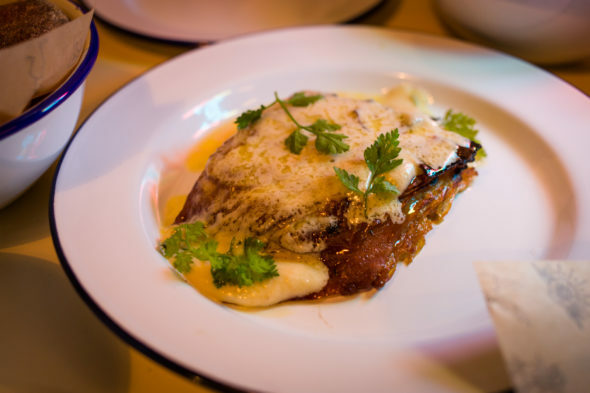 It’s been fascinating to see the Pinbone guys hit the reset button as they advance from pop-up to pop-up – and Mr Liquor’s Dirty Italian Disco jumps from the Asian focus of Good Luck Pinbone and settles for the feel of a red-sauce joint. Done really well, of course. 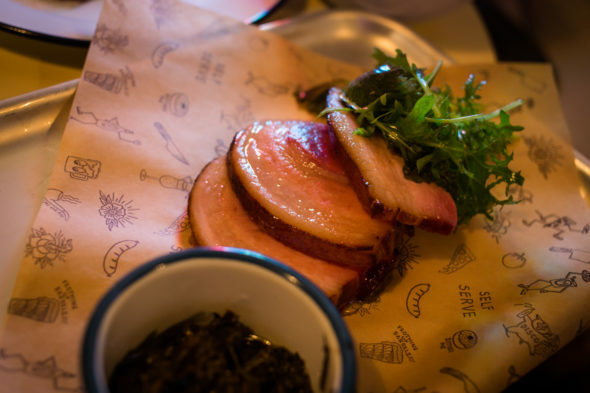 The menu might be an abridged take on pasta, bruschetta and meats roasted in the wood-fired oven, but it’s lengthy enough to make you regret all the variations on carbs and comfort food that you don’t have room to order – because what you do get is exceptionally good. 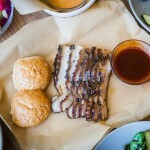 Will loved the Porchetta ($28), which is cooked low throughout the day on a bed of scallions. 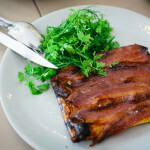 Mike and Jemma roll the pork belly and cure it in a hamming solution for up to four days, then grill and glaze it with honey and maple syrup. The scallions are charred and mixed with mustard and lemon, so there’s no shortage of flavour wherever you aim your fork. Will almost made a binding commitment to the Gnocchetti with Braised Lamb and Rosemary ($23) as well, but our table was quickly overrun with dishes, so it looks like that’ll make the shortlist for his next visit. 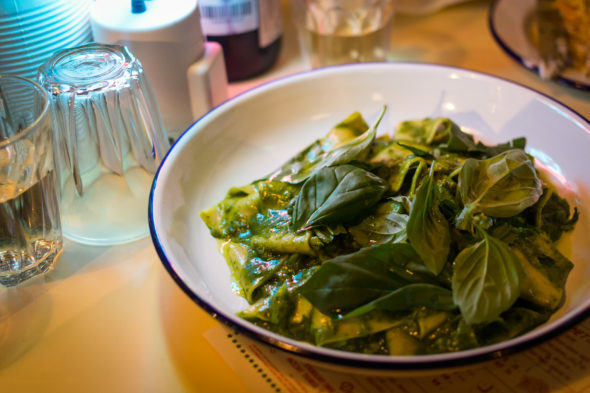 And seeing as Grab Your Fork’s Helen singled that out as the menu’s utter highlight, promising allegiance to the gnocchetti seems like a wise move. After hearing raves from both Nick Jordan and Rebecca Gibbs, I knew I had to order the Pappardelle with Green Vegetable Ragu ($23). The twist of pasta ribbons looks like it’s coated in a simple pesto, but that’s far from the truth. The green sauce has an ultra-clean lift that comes from a blanched blend of spinach, Cavolo nero, parsley and basil that’s been blitzed. And the chunky, nutty flavour is an impressive act of forgery, because there aren’t any nuts in it all: it’s confit garlic and onion with minced-up broccoli. It’s like a breezy, spring-loaded meat sauce that just happens to be vegetarian. And while the side dishes might seem like dismissable small print, I highly recommend you ask for them. Like the Polenta with Corn ($10), which is a descendant of the cult fregola corn dish that brunchgoers loved at the OG Pinbone restaurant. 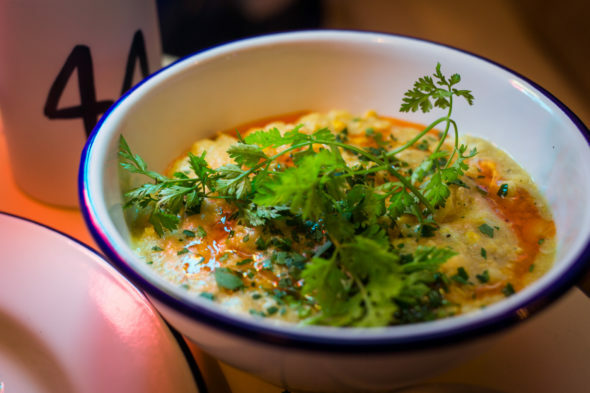 (Mike jokes that Mr Liquor’s corn polenta is fregola’s “little brother”.) Those bright yellow kernels get so maxed out, the dish is like pure uncut corn flavour – well served with a good buttery polenta that’s seasoned with a loose drizzle of chilli oil. 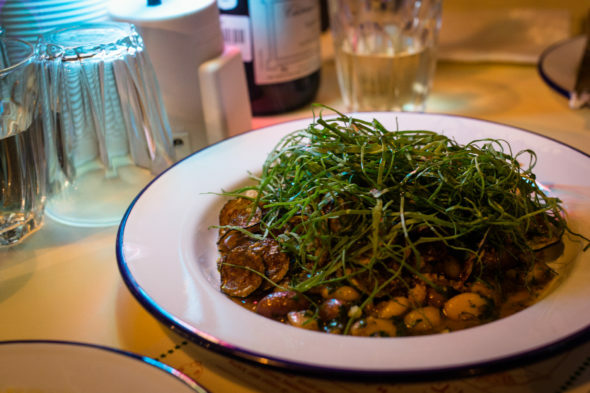 I also love the side of White Beans ($10), which is essentially groundcover for a crunchy and crusty nest of zucchini chips and pangrattato; it’s then freshly bombed with a grassy tickertape of sorrel on top. I also ate this the next day as cold leftovers and it was still insanely good; chomping through all those delicious textures was total ultra-savoury fun. Even a seemingly simple Vegetable Gratinato ($12), with slices of root vegetables stacked and swimming in taleggio sauce, is just a full-stop comfort. So I guess my guidance system for ordering here is not that helpful as I’d just say, “get everything”. Especially the Hazelnut Tiramisu ($11). 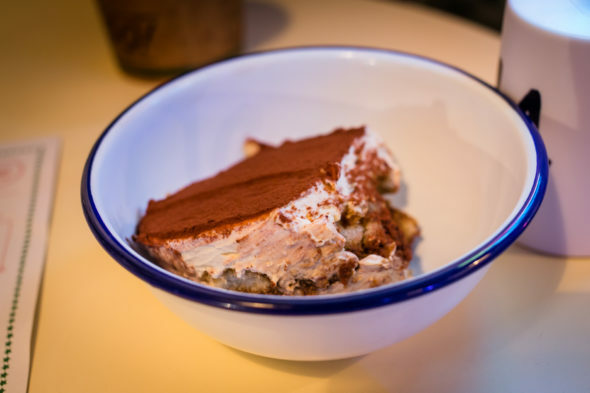 Jemma powers up the classic Italian dessert by essentially giving it a booster shot of Nutella and a base of crunchy nuts. It spikes up the contrast levels and it is so ridiculously good to eat. 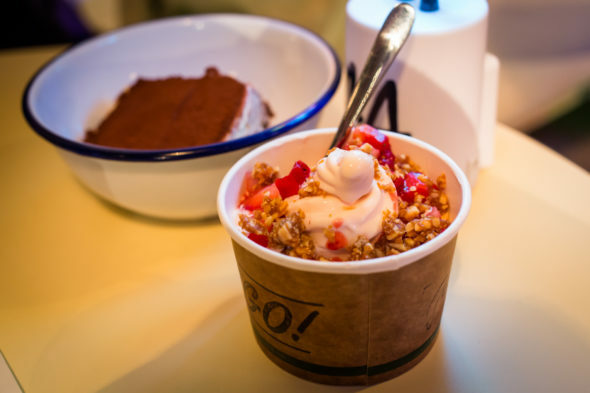 And the Strawberry Swirl Soft Serve with Pine Nut Brittle ($8) salutes the teeth-clomping joy of the Blueberry Granita with White Pepper Parfait and Pine Nut Brittle that was at the Woollahra Pinbone back in 2013. Like all Pinbone ventures, Mr Liquor is a bit of a clock-watching venture, ’cos these guys only have a six-month residency here before they split. So, even though this place just opened on Friday, definitely cram in as many visits as you can. There is a lot to love here, after all – except for, maybe, the frozen quality of the playlist (I think the “disco” in the name has been interpreted pretty loosely – mainly as pop hits that date up to Gnarls Barkley’s Crazy, circa 2006, and no later), but maybe the dated soundtrack is just really a smart prompt for all the cheesy songs you should try at karaoke. And if you’d wondered how Pinbone’s fiercely independent streak would fare on a project with a big company like Merivale, good news. It totally passes the stress test. There’s no apparent sense that the team has lost its individuality and, if anything, Mr Liquor’s Dirty Italian Disco feels like a fun idea that they’ve poured accelerant all over. So go on, hit the dancefloor. Mr Liquor’s Dirty Italian Disco, Tennyson Hotel Bottle Shop, 952 Botany Road, Mascot, merivale.com.au/mrliquorsdirtyitaliandisco. It’s a shame they don’t have a veggo version of the gnocchetti but I’ll be ordering the pappardelle on my next visit. Thanks for the link love <3 but what I really want to know is what cheesy 90s song I missed out on hearing you sing? !